Wrigley Field, home of the Chicago Cubs, is also home to one of the few scoreboards still operated by hand. Veteran scoreboard operator Darryl Wilson changes a number on the scoreboard. A worker in the scoreboard looks at fans in the center field bleachers during a game between the Chicago Cubs and the New York Mets in August 2009 at Wrigley Field in Chicago. Spare numbered steel panels are stored along the catwalk inside the scoreboard until they are needed to be inserted into an inning. Take Wrigley Field, home of the World Champion Chicago Cubs. Among the brick, ivy-covered outfield walls, the 103-year-old ballpark has new seating, dining and barroom areas, and a massive new high-definition Jumbotron. And just to the right of that Jumbotron is a living relic: a manually operated scoreboard. It's one of only two left in Major League Baseball from the days when manual scoreboards were necessary. The other is in Boston's Fenway Park. Wrigley's forest green scoreboard sits atop the highest point of the center field bleachers. The only way to get to that giant metal box in the sky is to climb up a steep ladder from the top of the bleachers through a trapdoor in the bottom of the scoreboard. Inside, there are three levels of platform floors, connected by steel staircases. From those floors, three Cubs employees can change out the steel plates for the runs scored in every inning, for each one of 12 games that could be going on simultaneously. When looking at the scoreboard from the stands, there are two columns; one for National League (Chicago Cubs) games, the other for the American League (Chicago White Sox). Five other games are listed above them on each side, though it should be noted that, because of space limitations, the 80-year-old scoreboard can fit only 24 of MLB's 30 teams. Sitting on the second level inside the scoreboard, Darryl Wilson removes two of the 15-by-20-inch steel panels from a later game to watch the action. From that perch, high above the center field bleachers, Wilson has a view like none other in the ballpark. "You see everything, that's the thing about it," says Wilson, 52, who has been working inside the scoreboard for 26 years. "You see the coaches and players in the dugout; you see some of the players talking to people in the bleachers; you see some things that a lot of people don't see sitting in their seats." But he doesn't often have much time to enjoy the view. On this recent Friday afternoon, the visiting Washington Nationals hit a two-run home run in the top of the first inning, and Wilson and his two co-workers get up and spring into action to change out one of those nearly 7-pound steel plates. "There's just a small clip; you turn it counterclockwise," Wilson says, showing how to unlock a wing-nut-like clip that holds the steel plate in place. It's not an easy task, as these pieces are old, and some of them are locked in behind large steel support beams. "Most of the time they're wedged in there 'cause they're a little rusty, so you have to give them a little quick punch to pop 'em out," he says, in between banging hard on the steel plate. He then replaces that blank plate with one painted with a yellow numeral 2. "Slide it up, slam it in," Wilson says, his words punctuated by loud "bangs" as he locks the plate into place. "That yellow 2 means the inning is still active," he says, "and that number's going to stay yellow until the top of the first [inning] ends." When the half-inning ends, the yellow number is replaced with a white one for the rest of the game. Wilson and his two younger colleagues repeat that routine each half-inning. That's at least 18 changes of the heavy steel panels in one nine-inning game. In addition to changing scores for the Cubs game, they're also running pitching changes for as many as a dozen other major league baseball games that might be happening at the same time. On a Sunday afternoon or during a weeknight game, when almost every team in the league is playing simultaneously, Wilson says, "You're working constantly. It's very physical ... you don't sit down down." Wilson explains that there are four games on each level, or floor, of the scoreboard. He often sits on the second level with a laptop giving him updates on scores from around the league. On the busiest days and nights, he says, it's tough to keep up, " 'cause when you run up to the third floor and come back to the second, you got two more changes." "And that constantly happens, all the way through," he says. "I don't even notice the Cubs game most of the time, because it's, 'Ahhh!' [and] running around." There are 344 total steel plates that fill out the entire scoreboard, including longer and much heavier team names, which often stick in place. "You really gotta beat the crap out 'em to get 'em out" and change those team nameplates, Wilson says. When many games are going on at once, he'll shout out changes to scores that need to be made in games on the level below him, but with the crowd noise from the game going on, Wilson says it can be hard to hear. "It gets a little crazy in here. We go nuts. I go nuts, I know, screaming at these guys, trying to scream over the crowd," he says. "It's hard to communicate for us." If it's a hot day, the giant steel box gets stifling inside. Wilson and his crew have to wear gloves to change out the scalding hot steel plates that have been baking in the sun. And during those cold days and nights early and late in the season, they're wearing heavy winter coats, ski masks and earmuffs. "When it's cold, you don't want the Chicago winds blowing through here because everything in here gets cold and it blows everything away," Wilson says. The only concession to technology in this 80-year-old scoreboard is a 1937 relay system that changes the number of balls, strikes and outs for each hitter. With the press of a button, by a worker both across the field and up in the press box, electromagnetic dots flip into place to form the numbers. It creates a loud, almost constant electric buzz inside the scoreboard during the games. It used to bother Wilson, but after 26 years, he says, "it's like I don't even hear it. I'm so used to it." If there are any drawbacks, he says, it's the physical part of the job, like running up and down the stairs from level to level to change scores, or climbing up the ladder and through the trapdoor to get into the scoreboard. "I think they add an extra step each year I work here, because it's getting rougher and rougher," he says. But nothing can compare to the excitement he says he felt during last year's playoff run to the Cubs' first World Series Championship in 108 years. "You sit up here, you feel this rush of all these people cheering," he says, describing how the excitement would build with each play through the playoffs and World Series. "It's an energy — you feel like a force when you sit up here with all that cheering. It's electrical." It's one of the reasons that after working in this odd place for more than a quarter of a century, Darryl Wilson still loves operating this old manual scoreboard, even if there is a much bigger and brighter video screen over left field. "We're like the history, you know, this keeping it real. This is authentic. That's the feel of old-time baseball," he says. "Everything about Wrigley is from the beginning, when baseball just started." Baseball's a game that honors tradition, like B.J. Leiderman, who writes our theme music. At Wrigley Field, which is where I believe the world champion Chicago Cubs play, that 103-year-old ballpark has a new seating and dining area, massive new video screen. But near that Jumbotron is a living relic, a manually operated scoreboard. It's one of only two in Major League Baseball, the other, of course, in Boston. 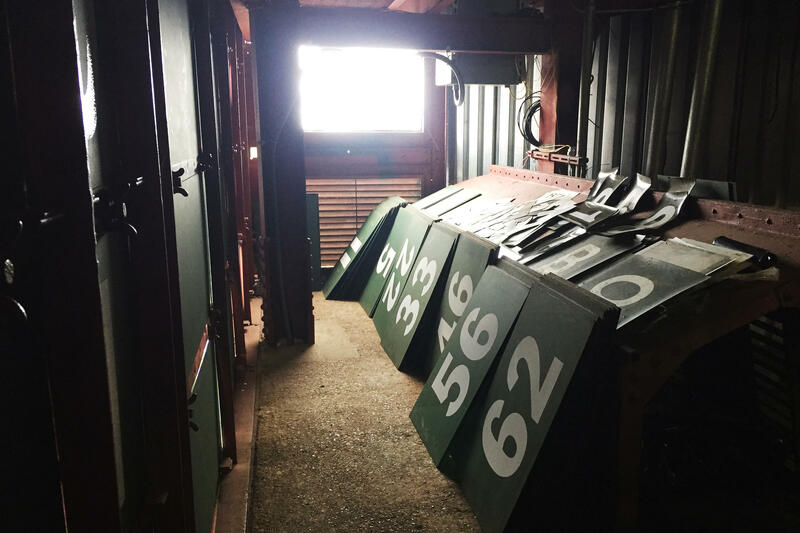 As part of our Backstage Pass series, NPR's David Schaper takes us inside the historic scoreboard. DAVID SCHAPER, BYLINE: From a perch high above the center field bleachers inside the massive, forest green scoreboard, Darryl Wilson has a view like none other in the ballpark. DARRYL WILSON: You see everything. That's the thing about it. You see things that a lot of people don't see just sitting in their seats. SCHAPER: But he doesn't have much time to enjoy the view. WILSON: Oh, man. That was a homer. SCHAPER: The visiting Washington Nationals hit a two-run home run. And it's time to get up and change out one of the nearly 7-pound, 15-by-20 inch steel plates. WILSON: There's just a small clip. You just turn it counterclockwise. SCHAPER: But it's not that easy. These pieces are old. WILSON: ...A quick punch to pop them out. SCHAPER: He then replaces a blank plate with one painted with a yellow number two. SCHAPER: And Wilson then locks that yellow two into place. WILSON: And that yellow two means the inning is still active. SCHAPER: When that half inning ends, he replaces the yellow number with a white one, which remains in place for the rest of the game. Wilson and his two coworkers repeat that routine each half inning. That's at least 18 changes of these heavy steel panels in a nine-inning game. And it's not just for the Cubs game. They're doing that for as many as a dozen games that might be going on in Major League Baseball at the same time. Fortunately for them, only 24 of the 30 teams fit on this old scoreboard that was built in 1937. WILSON: You don't sit down with this. You've got to constantly stand up because when you run to the third floor and come back to the second, you got two more changes. And that constantly happens all the way through. I don't even notice the Cubs game most of the time 'cause it's (vocalizing) running around. SCHAPER: If it's a hot day, the giant steel box gets stifling inside. Wilson and his coworkers have to wear gloves to change out the scalding-hot steel plates that have been baking in the sun. During those cold days and nights early or late in the season, they're wearing heavy winter coats, ski masks and earmuffs. WILSON: When it's cold, you don't want this Chicago wind blowing through here because everything in here gets cold. And it blows everything away. SCHAPER: The only concession to technology here in this scoreboard is 1937 technology. It's that loud electric hum and clank you're hearing from the electromagnetic dots that are flipped into place remotely to form the numbers for balls, strikes and outs. WILSON: That would be a ball. 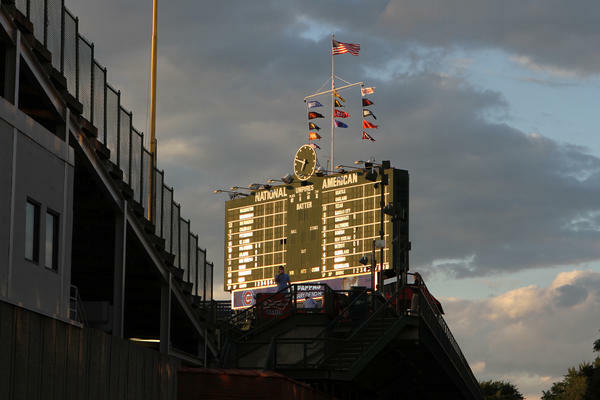 SCHAPER: The job does have a few drawbacks, like climbing up the ladder at the top of the center field bleachers and through a trap door to get into the scoreboard. WILSON: (Laughter) I think they're adding extra steps each year I work here 'cause it's getting rougher (laughter). 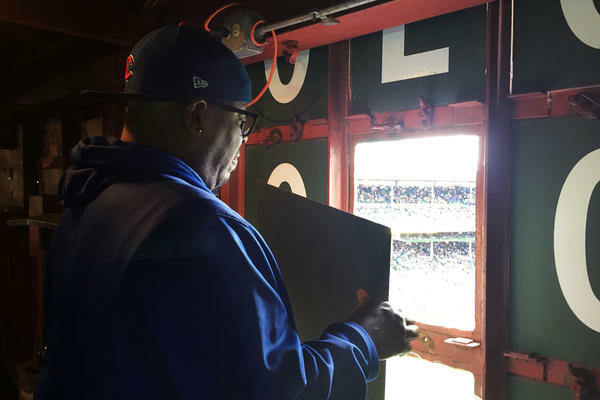 SCHAPER: But after 26 years, Darryl Wilson still loves operating this old, manual scoreboard, even if there is a much bigger and brighter video screen just a few dozen feet away over left field. WILSON: But we're, like, the history. Like, you know, this is keeping it real. You know, this is authentic. That's the feel of old-time baseball. SCHAPER: And Wilson was thrilled to be up in the old scoreboard to watch last year's run through the playoffs into the Cubs' first World Series championship in over a century. David Schaper, NPR News, Chicago. [POST-BROADCAST CORRECTION: In the audio version of this story, we report that just two Major League Baseball stadiums have manual scoreboards. 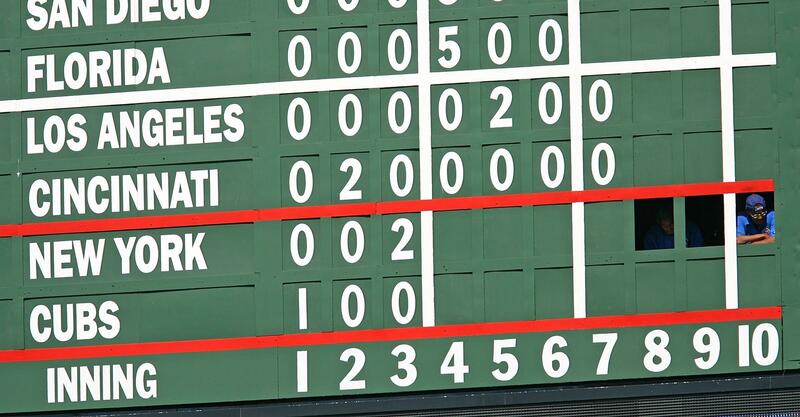 We should have noted that just two stadiums – Wrigley Field and Fenway Park – have vintage manual scoreboards. Several other modern stadiums have small manual scoreboards.] Transcript provided by NPR, Copyright NPR.